Japanese Episode 005: "The Battle of Nibi Gym!" 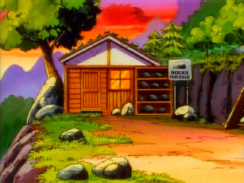 American Episode 105: “Showdown In Pewter City"
Satoshi and Kasumi finally arrive in Nibi City! 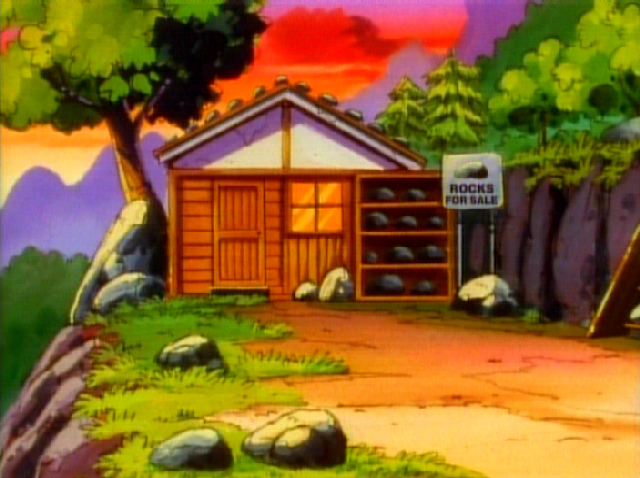 After meeting up with an old man named Munoh, Satoshi goes to the Nibi City Gym to battle the Gym Leader, Takeshi. Satoshi's Pikachu faces off against Iwaku, but the electric-type pokemon's attacks have no effect! Pikachu is easily defeated, much to Satoshi's dismay. 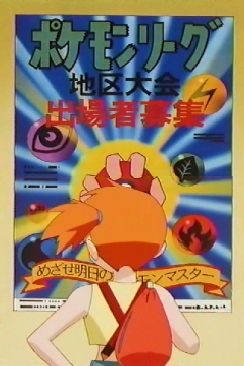 After healing his pokemon at the Pokemon Center, Satoshi vows to challenge Takeshi a second time. 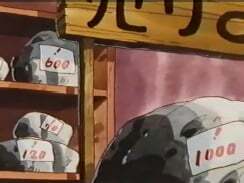 Munoh decides to help Satoshi charge up his Pikachu, so he hooks Pikachu up to a generator to give it a boost. Satoshi faces Takeshi again, and the recharged Pikachu makes quick work of Takeshi’s Ishitsubute. Next up is Iwaku. Pikachu is still no match for rock snake pokemon, and all seems lost until a stray spark from the electric mouse causes the sprinklers to go off. Now that Iwaku is drenched in water, Satoshi moves in to take advantage of the situation! Just as Pikachu is about to deliver the final blow, Takeshi's siblings grab onto Satoshi and beg him to stop! The young trainer recalls his pokemon and forfeits the match, saying that an accidental win because of a sprinkler wouldn't be fair. 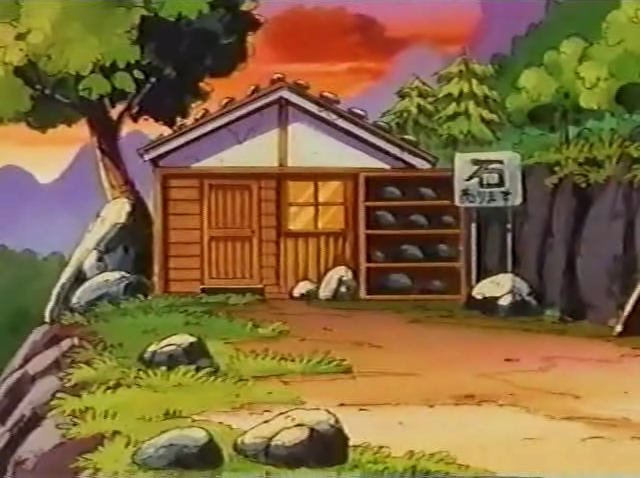 As Satoshi walks away from the gym, Takeshi gives him the Grey Badge. Munoh then appears and reveals that he's Takeshi's father and tells him that he's now free to pursue his own dreams. So, Takeshi decides to join Satoshi and Kasumi on their journey. Now that Satoshi has a new friend and a Gym Badge, he leaves Nibi City for his next adventure. Here we go, the series' very first gym leader battle. It's the very first time we see Takeshi. It's the very first time Musashi and Kojirou use the hole-digging scheme. And it's the first time Satoshi receives a pity badge. That's the unfortunate thing about the episodes based on the Red/Green games...most of the gym battles are won because Satoshi either got lucky or because the Gym Leaders felt sorry for him. "Skill" really has nothing to do with it. Of course, Satoshi was just starting out when he got to his first gym, so I guess it's understandable that the writers gave him a freebie, but when they start to give them out every other gym match, the "beginner's luck" reason doesn't hold together that well. This is also the introduction of Takeshi and his family. The fifteen year old Gym Leader is a little too serious in this first episode, but before long he'll turn into the skirt-chasing goofball we all know and love. Other than the first major dialogue mistranslation of the series, this episode contains the most paint edits so far. Unfortunately, it won't hold that title for long. Iwaku keeps its Japanese voice. During the pan of the various rocks Munoh has for sale, the wooden sign at the top of the screen has the Uri ("Sale") replaced with the English translation. Also, Flint charges a $2 fee for sitting on his rocks, while Munoh charges a 50 ¥ (approximately US $0.50) fee. Later, at the Pokemon Center, we're treated to one of the best looking paint edits of the series. 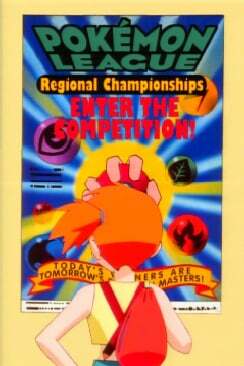 4Kids did a really good job with the poster. They emulated the style of the Japanese poster perfectly, and the translation is top-notch as well. Now I'm not a fan of the whole "let's replace Japanese text" bull, I wouldn't have as much of a problem with it if they all looked this good. 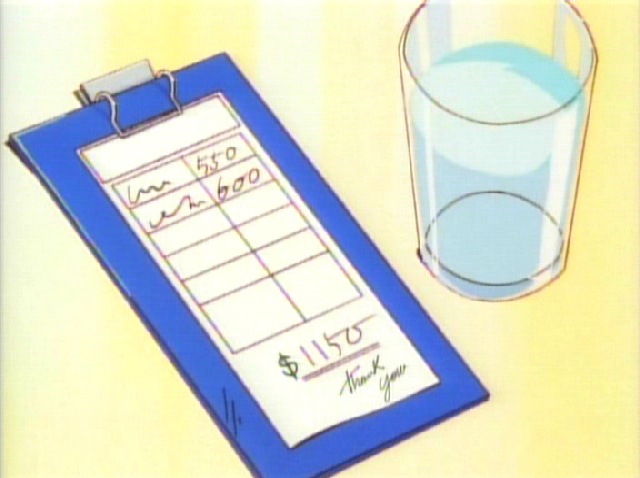 Next, in the scene where Kasumi makes Satoshi pay for her meal, the bill left was altered a bit. 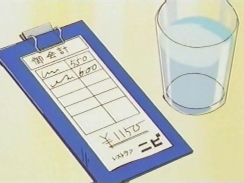 The kanji at the top of the bill was erased, and the ¥ symbol next to the final price (¥1150) was changed to a dollar sign so that it read $1150 instead. The words Resutoran Nibi (Restaurant Nibi) were also erased from the bottom of the bill and replaced with "Thank You." 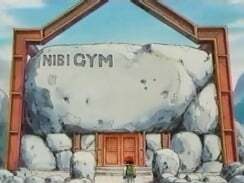 Every time we see the outside of Nibi Gym, the name of the gym is written on it in English letters. In the dub, NIBI GYM is replaced by PEWTER GYM every time we see the outside of Takeshi's gym. Click here to view images of the gym. 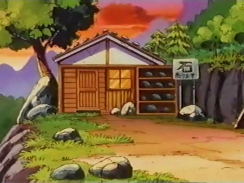 Finally, the sign outside Munoh's house originally said Ishi arimasu ("We have rocks"). 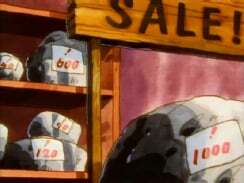 This is painted over to read ROCKS FOR SALE in the dub. Flint: "Brock has ten little brothers and sisters to take care of, so he could never leave town for regional championships." Flint: "His good-for-nothing father left the family to become a Pokémon Trainer and they never heard from him again. Brock's heartbroken mother tried her best to hold things together, but sadly, she passed away." Originally, Takeshi's mom didn't pass away. She, like her husband, simply abandoned the family. I guess 4Kids didn't want Brock to have two deadbeat parents, so they killed one of them off. Of course, at this time, neither 4Kids nor the original Japanese producers knew that Takeshi's mom would return to make 4Kids look like dumbasses, but that's all water under the bridge now. The note I have about the connection between Pocket Monsters and Fushigi Yuugi contains spoilers for Fushigi Yuugi. If you don't want to have the story spoiled for you, don't click on the link. If you don't mind, or if you've seen the entire series already, click here.